When one hears the word Kumbh Mela 2019, a picture of millions of devotees dipping in the pious and magnificent Triveni Sangam appears before eyes. Anything which involves such a vibrant Diaspora is sure to have its own share of fame and hence the Kumbh Mela is an event which is not only celebrated in India but has also visitors from around the globe. The history of Kumbh Mela dates back to more than 850 years. According to the Hindu mythology, the Kumbh gets its name from an immortal pot of nectar which the Devatas or the Demigods and Asuras or the Demons brawled over. The Devatas and Asuras, together produced a pot of immortal nectar. The Devatas, because of a curse were crippled of fear which made them weak and hence with a mutual understanding with the Asuras they prepared it together, promising each side half of their share. The task of making the nectar was done on the shores of a milk ocean that lied in the celestial region of the world. The Mandara mountain was used a churner and Vasuki, the king serpent as a rope. The demons were at the tail of Vasuki and Demigods at the head. The whole churning resulted in production of a deadly poison which was consumed by Lord Shiva, without being affected. Finally, with many such hurdles about 1,000 years later Dhanwantari appeared with the Kumbh with the immortal nectar but before it could have been divided, the Demigods fearing the immortality of the demons, seized the pot from Dhanwantari’s hand and gave it to the four Gods – Brahaspati, Surya, Shani, and Chandra. After learning about the betrayal, went after the Devatas and for 12 days and 12 nights, the hunt continued. During this entire hunt, a few drops of the nectar fell at 4 places, namely Allahabad, Haridwar, Ujjain, and Nasik. Since then these four places are believed to be lands of mystical powers. So, in order to mark these 12 days and 12 nights, every 12 years the Kumbh Mela is celebrated once in one of these 4 places at the banks of Godavari in Nasik, Kshipra in Ujjain, Ganges in Haridwar, and at the Sangam of Ganges, Yamuna, and Saraswati i.e. the Triveni Sangam in Allahabad. In India, different types of nature like rivers, mountains, and trees have been considered as Gods. In this course, ceaselessly streaming rivers, are given tremendous significance. Human presence exhibits their appreciation towards these holy rivers through Aartis’ on the banks of these rivers in which individuals demonstrate their commitment by singing song in the form of Aartis. In a few special occasions, these numbers of devotes are in hundreds, at others it may even go to a few thousand and to ceremonies like Kumbh Mela in India it accumulates crowd of over millions. In similar fashion, in Tirathraj Prayagraj Aartis’ are performed on the banks of Ganga, Yamuna and at Sangam with extraordinary appreciation, profound established respect and dedication. In Prayagraj, Prayagraj Mela Authority and different networks make preparation for these Aartis. The Aartis’ are performed in the mornings and nighttimes in which Batuks (Priests), typically 5 to 7 in numbers sing songs with incredible enthusiasm, holding beautiful lamps or earthen diyas and hymn to the Ganga, the Yamuna and the Sangam with most extreme dedication. The lights held by the batuks speak to the significance of panchtatva. Flares of the lights imply bowing to the waters. Allahabad Kumbh Mela involves numerous customs including bathing, which by far is one of the most important ceremonies performed at Kumbh. A great many explorers partake in the Kumbh Snan at the Triveni Sangam. This spiritual custom is as per the faith that by submerging oneself in the blessed waters, one is cleansed of every one of their wrongdoings, discharge themselves and their progenitors from the cycle of rebirth and accomplishment Moksha. Alongside, the devotees participate in sermons from various sadhus and saints. Though all the days are considered holy to take the dip in the sacred waters of Prayagraj Kumbh which is beginning from Makar Sankranti (first day of the month of Magh, when the Sun enters Capricorn) it is considered more auspicious, on a few particular days. Various saints and their disciples, and members of various Akharas (religious orders) have magnificent displays as they take part in the Shahi Snan also known as ‘Rajyogi Snan’ in the beginning of the Kumbh. The Shahi Snan is one of the main highlight of the Mela. It is only after the Shahi Snan that the people are allowed to take the holy bath. It is a belief that the people will get the extra advantage of the essence of holy deeds and thoughts of the saints if they take the dip after them. The Kumbh Mela also contributes to the societal benefits by donations to the poor and helpless, to the saints, and to cows. The donations may range from basic food and clothing to even precious metals. It is having been put in the list of “Intangible Cultural Heritage of The Humanity by UNESCO in 2017. It is one of the largest public gathering in world as a collective act of faith, in the world. It is so huge that It can be even seen from the space. The beautiful and pious Allahabad has been blessed with the gift of confluence of Ganga, Yamuna and Saraswati along with Ambrosia itself from heaven. It is of the top listed place for those interested in Hindu Mythology and exploring the ancients. Here are a few top attractions which the city has to offer apart from the humongous Kumbh Mela 2019. The illustrious shower is one of the most extraordinary attractions of the Allahabad Kumbh Mela 2019. Under this, every one of the holy people of the Akharas wash up in the blessed Triveni Sangam, before the other devotees. It’s the primary custom of the Kumbh Mela wherein the Sadhus and Saints will wash up in the heavenly water after every one of the sadhus have taken the equivalent, the rest of the public takes the holy dip. Akhara is where every one of the sadhus from different religious gatherings get together and pursue the religious practices. Among the holy people, some are supporters of Lord Vishnu while some are the devotees of Lord Shiva. A few sadhus stay exposed body while some wear garments of saffron shading. These holy people are known for expanding the heavenliness of the Kumbh Mela 2019 and it’s something appealing to watch them. Kumbh Mela’s another fascination is its camp life. Those taking part are assigned with the camps or tents with regards to their convenience. Travelers love to remain in tents as it is energizing to invest evenings in the open territories. Though the Allahabad city is brimming with explorers and enthusiasts amid the day, the nightlife is also very satisfying. One can appreciate the quiet river, cool wind and the sparkling Ghats, which will make the view entrancing. Sangam, Allahabad Fort, Patalpuri Temple, Hanuman Mandir, Ashok Pillars, Shankar Viman Mandapam, Mankameshwar Temple etc. 1. When and Where is Kumbh Mela 2019? The 2019 Kumbh Mela is in the holy lands of Allahabad presently called as Prayagraj from 15 Jan 2019 – 4 Mar 2019. 2. Why do Indians celebrate Kumbh Mela? As per Hindu mythology, Lord Vishnu dropped Amrita or nectar (a drink of immortality) for which there was a fight between the Asuras and the Devatas, at four places, while transporting it in pot. These four places are identified as the present-day sites of the Kumbh Mela, Prayag Kumbh Mela, Haridwar Kumbh Mela, the Nashik-Trimbakeshwar Simhastha, and Ujjain Simhastha. The name “Kumbh Mela” means “kumbha fair”. 3. When did Kumbh Mela start? When and where first time kumbh mela start is uncertain. According to chinese scholar Xuanzang Kumbh Mela started at 644 CE at Prayag. However according Kama Maclean Australian researcher this is reference about a buddhist celebration happened in every 5 years. The first British reference occurred in 1868, the Kumbh mela started at 1870. 4. When was the last Maha Kumbh Mela held? 5. How often is Kumbh Mela held? 6. What happens in a Kumbh Mela? Kumbh Mela is the biggest auspicious festival held in India. It is a mass Hindu journey where Hindus assemble in a large number and wash up in a sacrosanct stream. This is one of the greatest occasion for the Hindu people group that is held each fourth year at four better places. Hindus from India as well as countless, pioneers and remote nationals participate in this occasion. Sages and religious zealots wearing saffron clothing types go to the Kumbh Mela in extraordinary arrangement. The mela is commended at four better places. 7. Which is the Allahabad Kumbh Mela 2019 official website? The official website for the Kumbh Mela 2019 is https://kumbh.gov.in/. 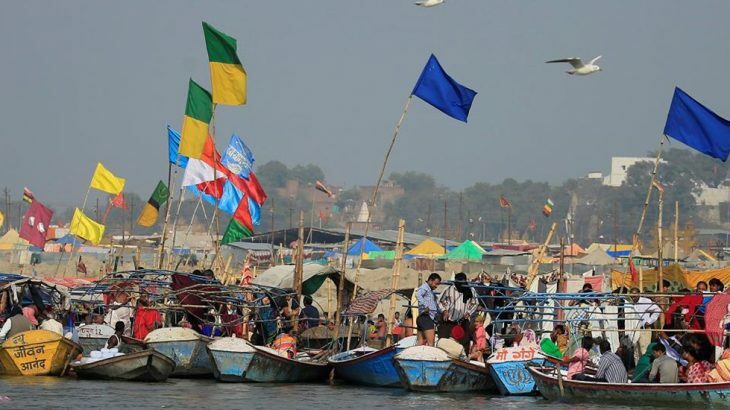 You can find all the information related to Kumbh 2019 being held in Allahabad, recently named as Prayagraj recently, here. 8. What is the significance of Kumbh Mela? Mythological Significance: The origin of Kumbh Mela was transcribed by Shankara, an 8th-century philosopher. According to him, the myth related to the Kumbh Mela goes back to the Puranas (a compilation of ancient Hindu legends). It talks about how Gods and demons fought over a sacred pitcher (Kumbh) of Amrit or nectar of immortality known as the Ratna of Samudra Manthan. It is believed that Lord Vishnu (disguised as the enchantress ‘Mohini’) whisked the Kumbh out of the grasp of the covetous demons who tried to claim the pot. Because of the tussle, a few drops of the nectar or Amrit fell at 4 places, where every three-year Kumbh Mela is held. 1. When Jupiter moves into Leo, the festival is held in Nasik on the banks of river Godavari and in case of Jupiter moving in to Leo and the Sun entering Aries, the Kumbh Mela is held in Ujjain. 2. When Jupiter enters the Aries and the Sun and Moon are in Capricorn, the Kumbh Mela is held in Allahabad on a new moon day. 3. When the Sun is in Capricorn and Jupiter moves into Taurus, the Kumbh Mela is held at Allahabad. 4. When Sun, Jupiter and Moon enters into Cancer on Amavasya, then the Kumbh Mela is held on the banks of Godavari. 5. When Jupiter enters the Aquarius along with the Sun moving in to the Aries, the Kumbh Mela is held in Haridwar. 6. When Jupiter enters Libra and the Sun, and the Moon remain together on Kartik Amavasya (8th month of Hindu year) then the Kumbh mela is held in Ujjain. Kumbh Mela plays a very important role in the cultural, spiritual and cultural heritage of India. Being one of its kind, it draws the world’s attention and people across the globe come to witness the power of spirituality. The Allahabad Kumbh Mela 2019, is going to be all about awakening of devotion and knowledge and meeting the mystics of the rich cultural heritage of India. Come, be a part of this pious gathering. Events, Golden Triangle, India Tour agra tour, delhi tour, jaipur tour. permalink.